Sometimes you just need to slow down and enjoy life. But work, kids, home, family and a host of other things keep your days filled. Finding any way to ease the daily pressure is important. One of those ways is doing your grocery shopping online. Pick up your groceries with curbside pick up when your schedule allows. Or, have the groceries delivered to your door. Heck, you don’t even have to get out of your jammie’s if you don’t want to. Hugo’s Family Marketplace was founded in 1939 by the Hugo Magnuson Family in Grand Forks, ND. 78 years later, we are still operated by the same family. So, we understand family commitments and the importance of spending quality time with your family. We want to help. 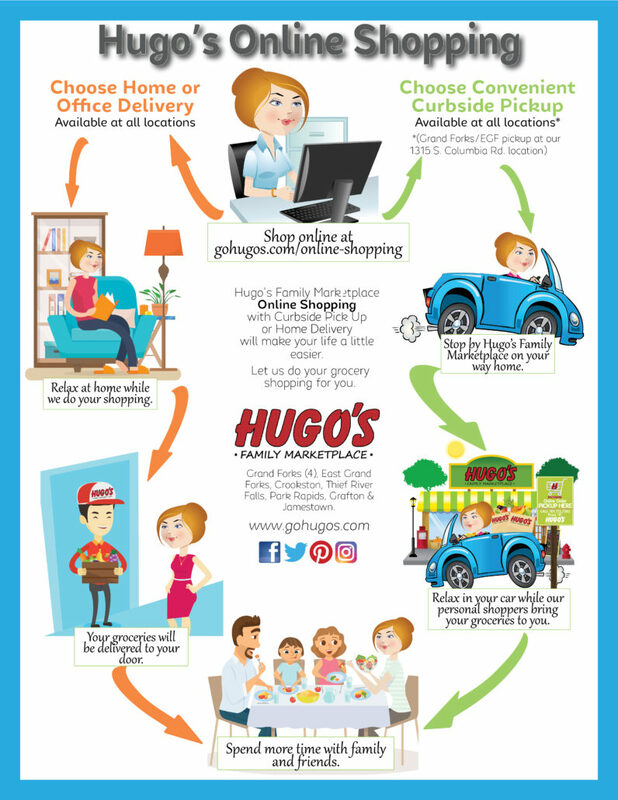 That is why we have launched online grocery shopping with curbside pickup or home delivery at all 10 Hugo’s Family Marketplace stores in North Dakota and Minnesota. Check out our graphic below on how easy it really is….then give it a try. Orders over $100 are delivered FREE and if this is your first time ordering online, enter promo code SAVE10 to receive $10 off your $100+ order.